Exclusive VIP Invites & Updates - Sign Up Now! The watch experts at Wixon Jewelers have been offering our clients the best price for their Swiss watches for over 20 years! While we are recognized as the premier Swiss watch retailer in the Midwest, a lesser-known fact is that we accept trade-ins and also purchase pre-owned watches. There are several outlets available to sell your watch and Wixon Jewelers provides an experience unlike any other. When trading or selling a luxury timepiece, you want to be sure that you’re dealing with a trustworthy and reputable organization that will offer you a fair and transparent value. Our watch experts have been offering our clients the best price for their luxury timepieces for over 20 years. If you are looking to sell or trade your watch, look no further. We specialize in purchasing major high quality Swiss timepieces such as Rolex, Patek Philippe, A. Lange & Sohne, Cartier, Breitling, Omega, Tag Heuer and many more! As true watch connoisseurs, we are always looking to purchase vintage timepieces from Swiss watch manufacturers. You’re sure to get the most for your vintage watch at Wixon Jewelers! If you have an antique pocket watch that you never wear or is just collecting dust, we’d love to look at it and make an offer. We are often asked about the value of a client’s current timepiece and this is a difficult question to respond to in a broad sense. The best answer is that it depends on the brand, style, condition, popularity and market value of the watch. Our watch experts and appraisers will make an offer on your timepiece at no charge with no obligation. Benefit from our experts who know luxury watches inside and out. We can tell you the real value of your watch and we’ll give you the best price possible. Our watch buyers are constantly on the hunt for the world’s most popular and enticing watches… your timepiece may be just what we’ve been looking for! 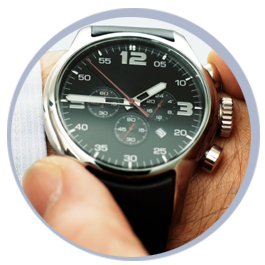 Contact our watch experts if you have questions about selling or trading your timepiece.